The poems in Stories from the Ruins are a meditation on the site of the Towers itself, what they and the lives entwined with them represented, and what they came to represent both during and after their destruction. Comprising both elegies for the victims and stark, evocative descriptions of what we saw as it happened; the process of making sense of a senseless act; and the observed acts of search and rescue, recovery, mourning, the sixteen poems are both deeply personal and yet universal. They speak to the common experience of New Yorkers, and others who have suffered similar acts of violence. 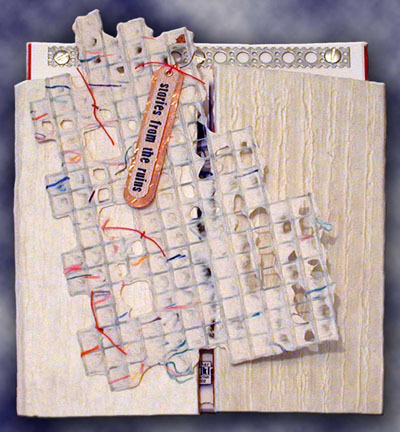 The chapbook is a handbound hardcover edition designed and containing original color illustrations by Marcia Gilbert and photos by NYC Police Officers Sheryl Puletz and Claire Hoglund. Stories from the Ruins marks the first collaboration between Gilbert’s Another GridKid Production and Lee Kottner. Another GridKid Production is owned and operated by Marcia Gilbert, producing graphic illustration, artist’s books, and art cards. broken-toothed in the old city center. Rarely, time alone makes ruins. what took years to build. in this city of islands. Price: $500.00 + $20.00 shipping and handling (tax included). Click "Add to Cart" to purchase with a credit card or e-check through Paypal. For money orders, please email me.